PDX vs. LBC: THIS IS HOW WE COOK. I have this friend who lives in Long Beach. He’s fall, he’s from Texas, he designs clothing for a living, and he looks a lot like Woody Harrelson. His name is Taylor and he is one of my “besties”. In fact, he was a groomsmaid in my wedding last summer. Taylor is what I would call a competitive person. I could also be classified as competitive, which has made for some interesting bumps in our friendship. Most of our competitiveness comes out in internet fights about bizarre and rare wild animals, knowing where the capitals of foreign countries are, and most of all: Scrabble. I think that Taylor and I have nearly killed each other on many occasions due to internet Scrabble games. Once a month, we will have a cooking “challenge”. We blindly pick ingredients on Monday, shop for food on Tuesday, and cook on Wednesday of the same week. Yes, we realize this is a lot more time than the contestants on Chopped get – but we are busy people with full-time jobs, and so we gave ourselves a couple of days to prepare. After we cook the challenge meal, we will post photos and descriptions of our creations on the blog and let the readers decide whose dish “reigns supreme”. How do we “blindly pick” ingredients, you might ask? Good question. Each couple made a list of ingredients that we wanted included in the challenge (keeping in mind that we want creative ingredients) and categorized our choices numerically under four main categories: Proteins, Vegetables, Starches, and Miscellaneous (spices, sauces, fruits, etc.). Each team had to have ten items in each category. We decided that for the first round, Nich and I would choose from Starch and Miscellaneous, and Taylor and Brit would choose the Protein and the Vegetable. So, we picked two from their list (i.e. we want to work with Starch #4) and they picked two from ours. They don’t get to see our list, and we don’t get to see theirs. And, so, we get four totally random ingredients. So, for our first round, we ended up with a pretty interesting array of items: Scallops, Sweet Potatoes, Cucumber, and Whisky. Weird combo, right? I had a minor heart attack when I read the list. Some of the flavors go so nicely together (Sweet potatoes and whisky, for example. Mmmmmm...) and yes some seem so horribly opposite (sweet potatoes and cucumber? Ew.)! And yes, we had to use all four ingredients in one coherent dish. So, here we are a week and a half later and we are just getting around to posting pictures. I will say that for our very first challenge, both teams cooked brilliantly! 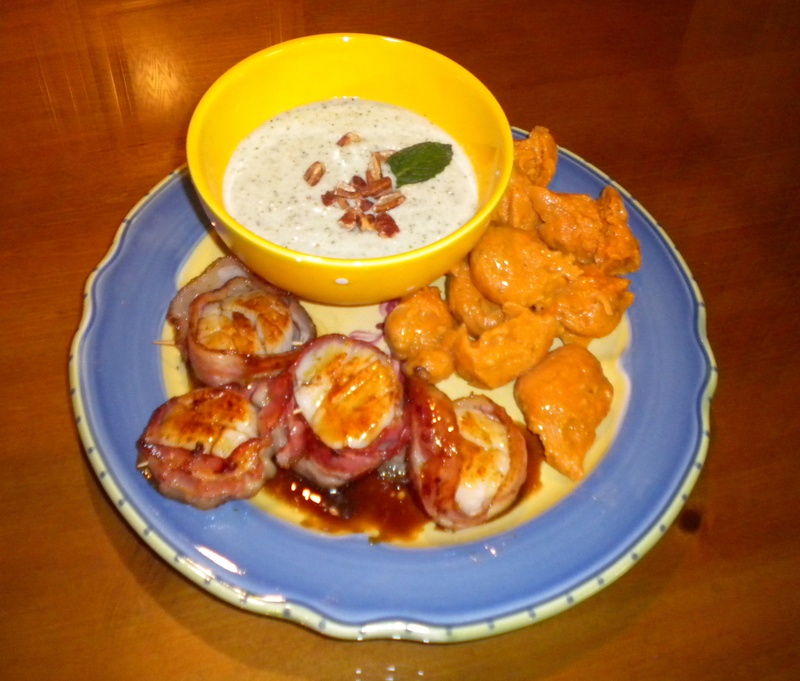 We both found interesting and tasty ways to combine a bizarre mixture of flavors and textures. So please, take a look at the pictures, read the descriptions, and tell us which dish that you like best (or which dish you’d eat!). Taylor and Brittany used our bizarro combination of ingredients and came up with a meal that I wish I could have eaten. It sounds so delicious. Chilled Cucumber Mint Soup – Made with cucumber, mint, yogurt, lime juice, sauteed garlic and toasted pecans. Sweet Potato Gnocci – A sweet potato dough seasoned with mint, salt, pepper, and nutmeg. Served with melted butter. Bacon Wrapped Scallops with a reduced Whisky Glaze. For our meal, Nich and I ended up with something completely different than Taylor and Brit. I love that both couples came up with totally different (and delicious) combinations. 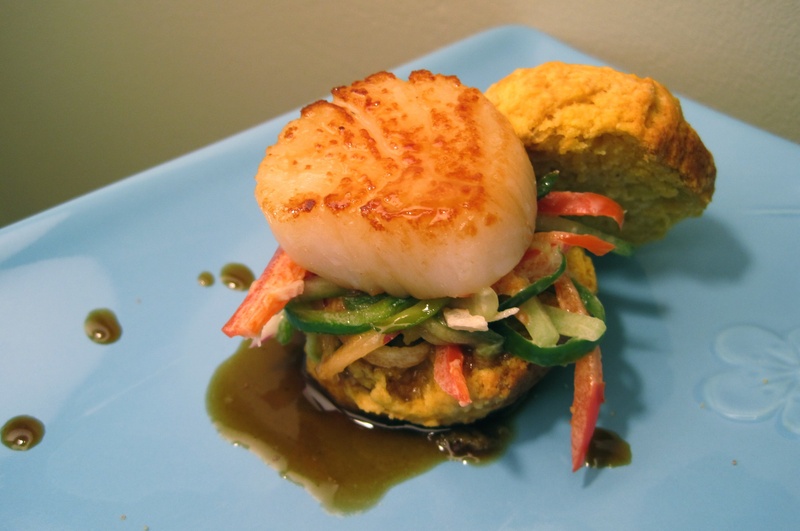 The scallops were served on a Sweet Potato Biscuit, with Cucumber Jalapeno Slaw. As I said before, for our first challenge, I am extremely proud of all of us. If we are being honest, we aren’t doing this to “win”. We are doing this to become better cooks, and to familiarize ourselves with different ingredients and food combinations. And that is exactly what we did. And I will say that sweet potato biscuits will now be a staple of my diet. They are one of my new favorite things to eat (I will post the recipe for them this weekend!). All in all, the LBC vs. PDX challenge was a success, if I do say so myself. ← my mother, the food blogger. You guys are ridiculous. And I totally love this. N&L definitely get bonus points for combining all the ingredients into one dish. However, gnocchi is possibly my favorite food in the whole world (behind my family’s famous Jell-O salads, of course), so… I refuse to vote. Good work. I’m definitely looking forward to this as an ongoing series. i vote for yours, because it was more comprehensive (all the ingredients in one dish) and the pictures were waaaaaay better. no offense to your friends, but you smoked them. I have to vote for Taylor’s. Holy cow, sweet potato gnocci?! I am an efficient man. While both meals look positively mouth-watering, my vote goes to N&L for the ingenuity to combine all four disparate ingredients into one harmonious culinary moment. Bravo! When are we going to see the fruits of Challenge #2? It was delish.